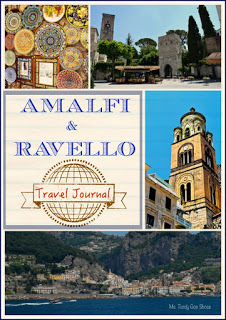 (This is a multi-part journal of our recent trip to the Amalfi Coast. You can read Part 1 here). I've got a feeling we're not in Naples, anymore, Toto. The scenery has changed drastically, as we drive along the coast. No more traffic, no more congestion. We're winding around the cliffs, and I'm snapping photos like a mad woman through the car windows. 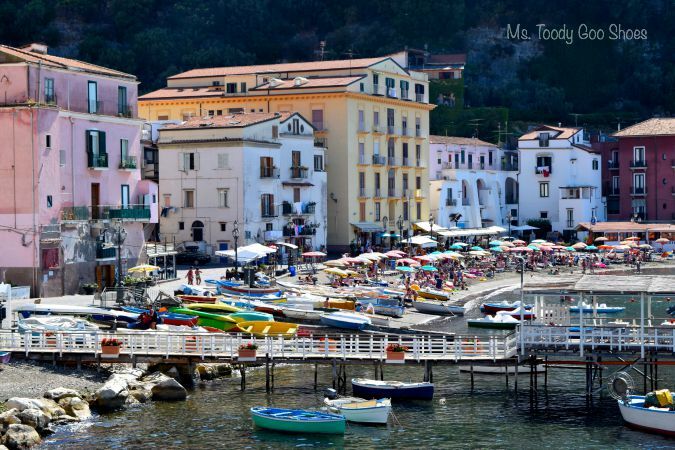 I refrain from asking the drive to pull over, until he says, "3, 2, 1...there's Sorrento!" It literally takes our breath away. I ask him to stop; he says we will, but either he doesn't understand me, or he forgets, because we don't stop, and I miss one of the best photo ops of the trip. I'm sulking. We arrive at the Hotel Tramontano. 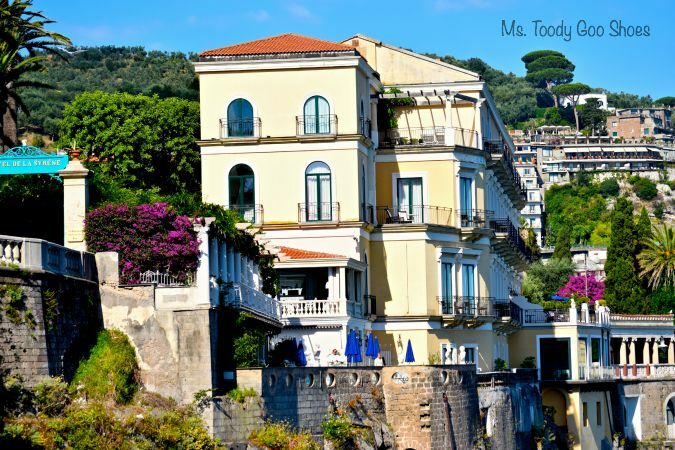 It's perched at the edge of the cliff, overlooking the sea. I'm hoping it's not one of those "but it looked so nice online" places. I needn't have worried. It's beautiful. The hotel has a rich history. It's been around since 1812. 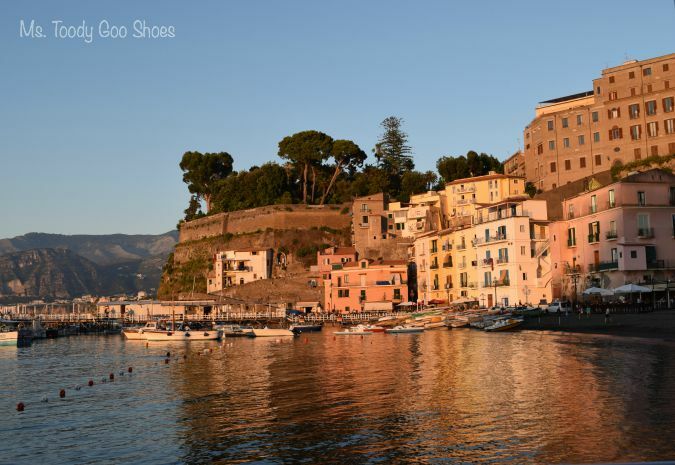 You know that song, Come Back to Sorrento? It was written right here on this terrace. Yup. When I planned this trip, my one requirement was that each hotel have a sea view. I go straight to the terrace, and fling the doors open. I think I'm holding my breath. Oh. My. God. It's perfect. It doesn't get any better than this. Oh, but it does get better! 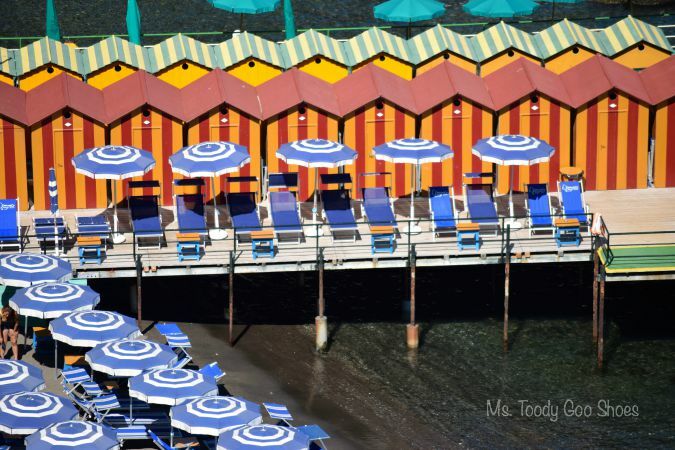 Looking down below, is the sparkling sea, jagged cliffs, colorful beach umbrellas and cabanas. 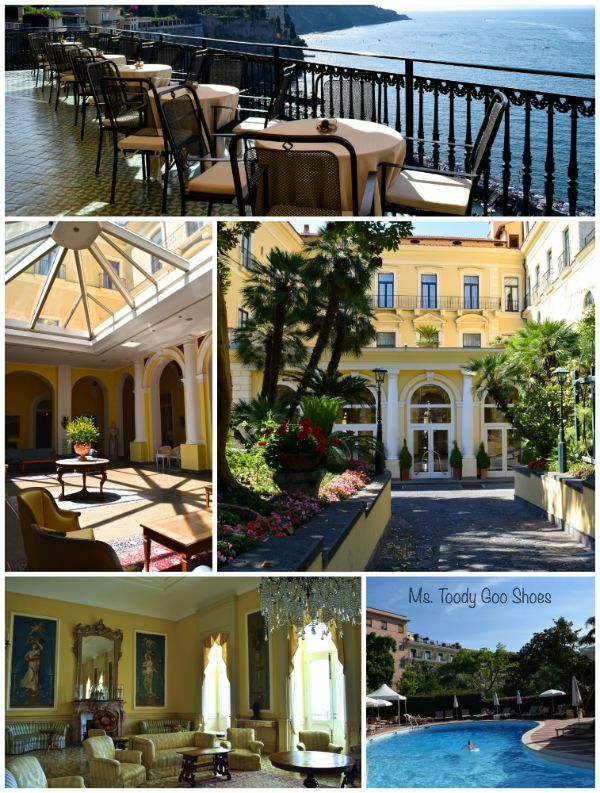 I do a happy dance right there on the terrace, which makes Mr. Goo Shoes a little nervous. 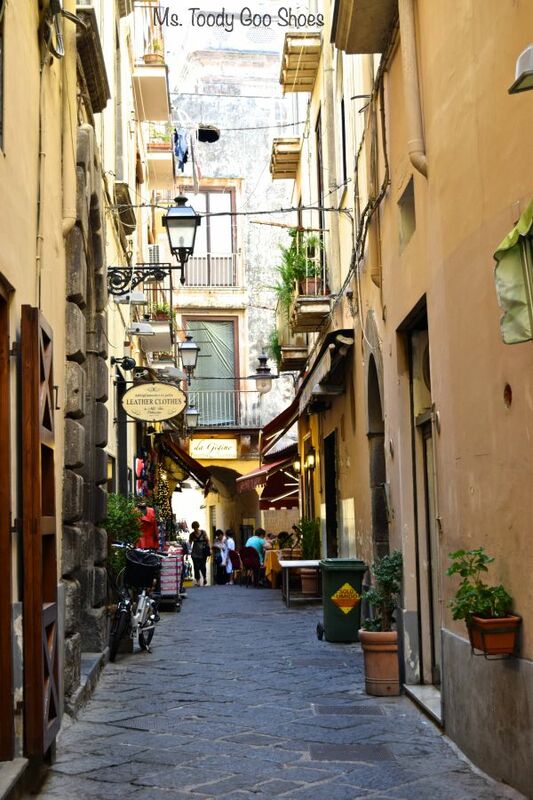 The hotel location couldn't be better, just steps from the pedestrian-only main streets. It's lunch time, and we're hungry. I am armed with my Tripadvisor list. Nope, we can't eat here, it's the one that got a bad rating. How about this place? Mr. Goo Shoes wants to keep looking. 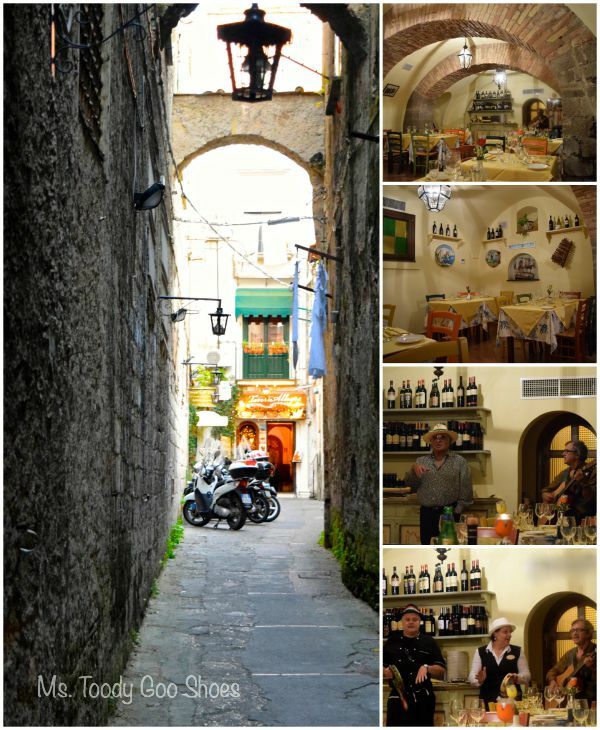 I put away my Tripadvisor notes, and let him choose; it's hard for me to relinquish the restaurant reins, as I don't want to "waste" one of our meals in Italy. We settle on an outdoor cafe that promises good service with a smile. No promises about the food, however, worries me a little. We order paninis...delicious! The name of the restaurant -- Sedil Dominova -- is lost on me for the moment, but in a few hours from now, I'll understand it. We feel much better having a good meal under our belts, which now need to be loosened a notch. After lunch, we hit the streets...a shopping paradise! I vow silently to shop till I drop. I just got here, haven't bought a thing, and I'm already worrying about how I'll fit the souvenirs in my suitcase. 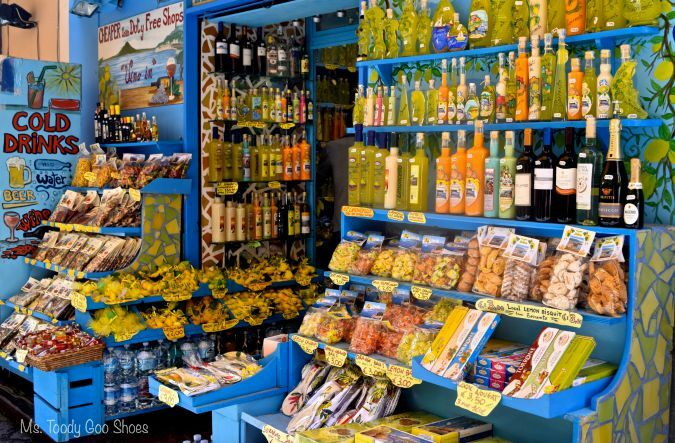 It takes all of five minutes to see that life gave Sorrento lemons, and they have not only made lemonade, but everything under the sun that one can think of...cookies, candy, soap, lotions, ceramics, tea towels, oil, pasta, honey, and oh, yes, Limoncello. 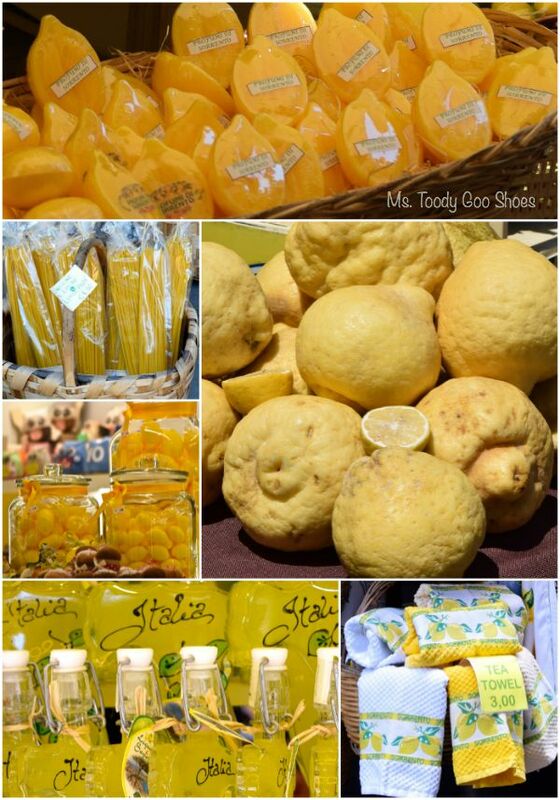 I buy some lemon soaps and lemon honey for my Ms. Toody Goody-box Giveaway. 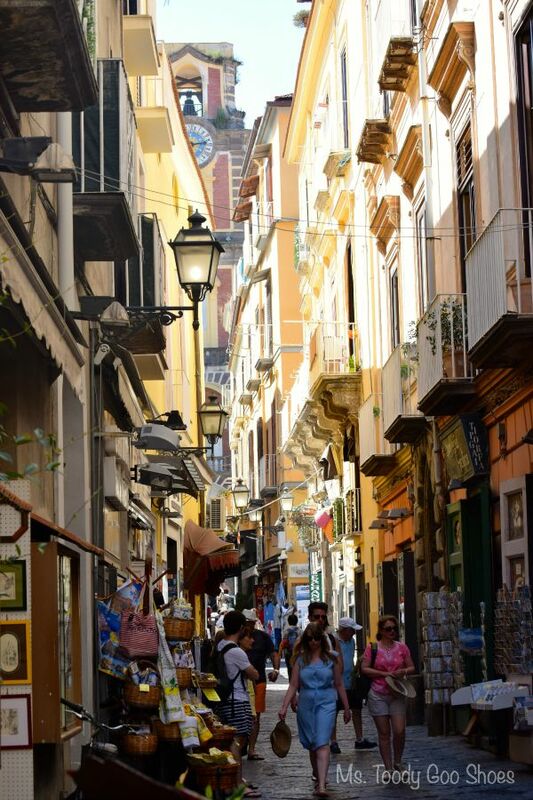 At the end of the street, we find ourselves in the main square - Piazza Tasso. Now we're back to where we had lunch, and I notice a structure I hadn't seen before. I was too busy stuffing my face with that panini. We peak inside -- I recognize it immediately from my pre-trip research. It's where men have gathered for centuries to discuss civic matters. And play poker, it seems. I put my feminist feelings aside just briefly, to enjoy the scene (Later, I look up the name -- Sedil Dominova -- just like the restaurant, which we had lunch in, which is literally in its shadow. Aha!). Geez, it's late afternoon, already. Mr. Goo Shoes heads back for a nap. Nap? I don't understand the concept. If I didn't have to, I wouldn't sleep at all. 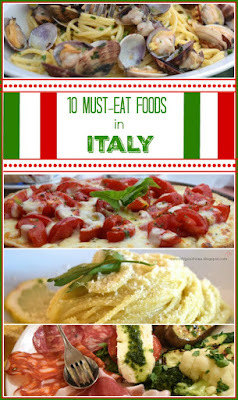 I mean, we're in Italy! 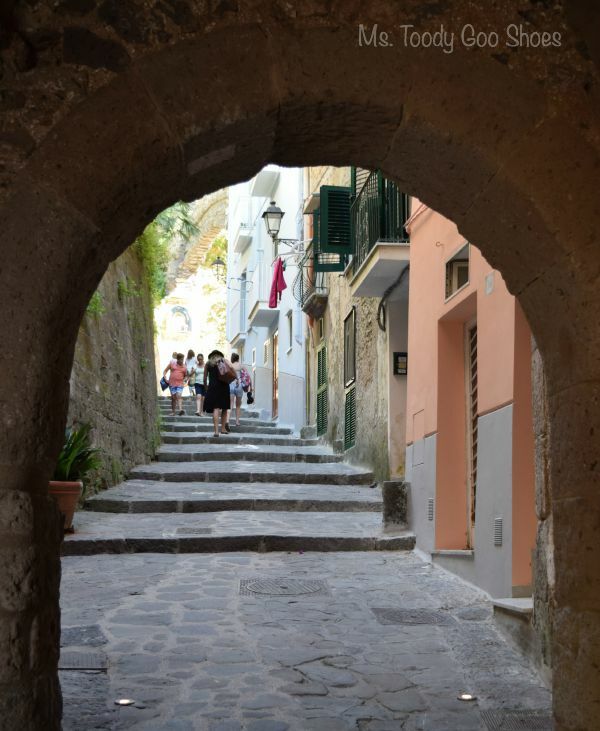 Now that I've got the lay of the land (it doesn't take much - this area of Sorrento is pretty compact), I venture off on my own. 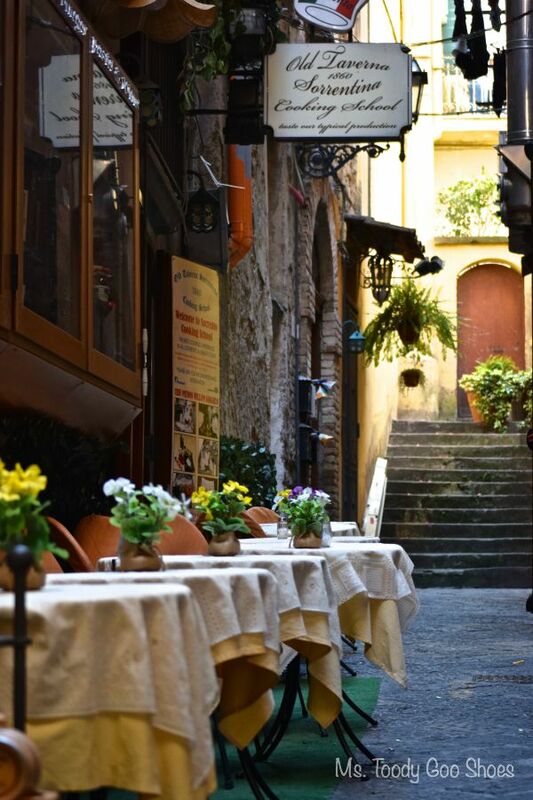 The little alleyways are oozing with charm, and get my heart pumping. I can't stop smiling. OK, maybe I do need to rest for just a little bit before dinner. Plus, I have GOT to make time to sit on that glorious terrace. 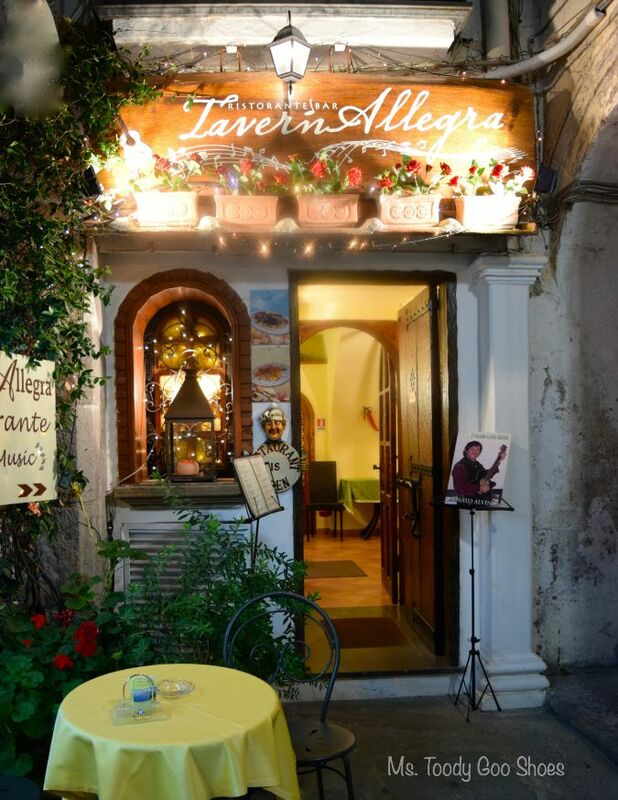 We have a dinner reservation at Taverna Allegra. I'd read that the live entertainment makes for a really fun evening. I better check the directions on Google Maps. Hmmm...looks pretty easy. We leave with time to spare. Uh-oh, I'm confused. We are seriously lost--and now, late. But wait - there's that little grocery I saw on Rick Steve's show! Just like where I shop in NJ, lol. "Do you know where Tavern Allegra is?" We ask this to half a dozen different people. "Turn left just ahead." Well, no wonder we can't find it. It is down the teeniest tiniest alleyway! We get to the door, and the owner comes to greet us -- "Signora Amy?" OK, I'm impressed. I guess he's used to people showing up late because they're lost. Uh, there's hardly anyone here. Our night of singing along with the waiters isn't going to be all that lively, if it's just me and Mr. Goo Shoes. A few other people show up, but it's disappointingly empty. The guitar player is pretty good! And Peppe, the owner is singing. The waiters sing, too. We're having fun -- the wine is helping. Complimentary prosecco to start, that's nice. Bruschetta, too. I ask the waiter, since I'm obsessed with being right about this, if it's bru-SKEH-ta or bru-SHEH-ta. He's looking at me like I'm nuts, which is surely up for discussion. "We say bru-SKEH-ta." I tell him that everyone in the states says bru-SHEH-ta. He's laughing like that's the funniest thing he's ever heard. I'm gloating. I like to be right. 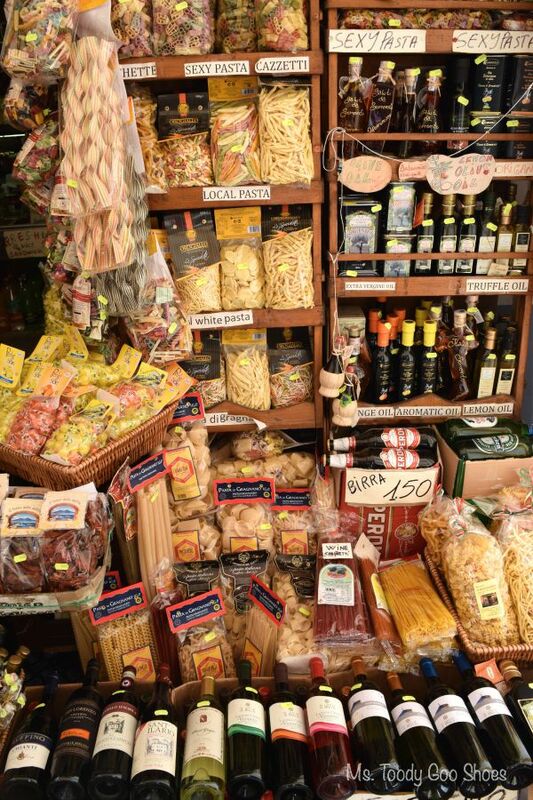 We share an antipasto for two; laughing about the salami story from our first trip to Italy. I have fettucine with clams and zucchini. AMAZING! Mr. GS has lasagna - he's happy, except he now realizes that I am serious about taking pictures of everything I eat. I am thrilled when the lady next to us starts taking pictures of other people's food. Now I don't look so bad! 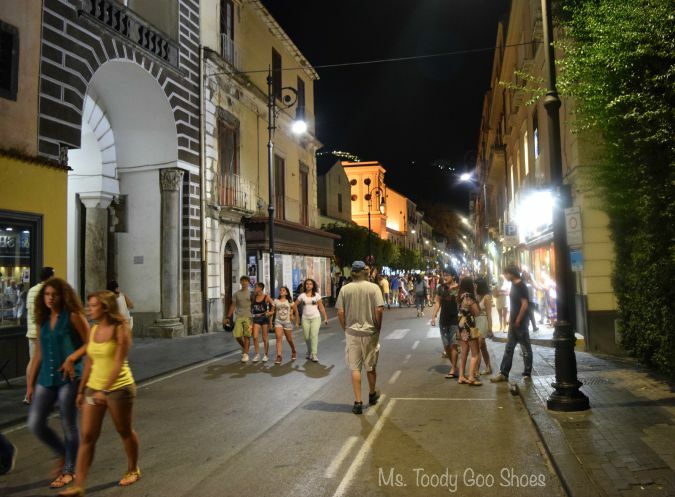 When we're through, it's time to participate in the very Italian tradition of the "passeggiata," which simply means, strolling the streets in the evening. 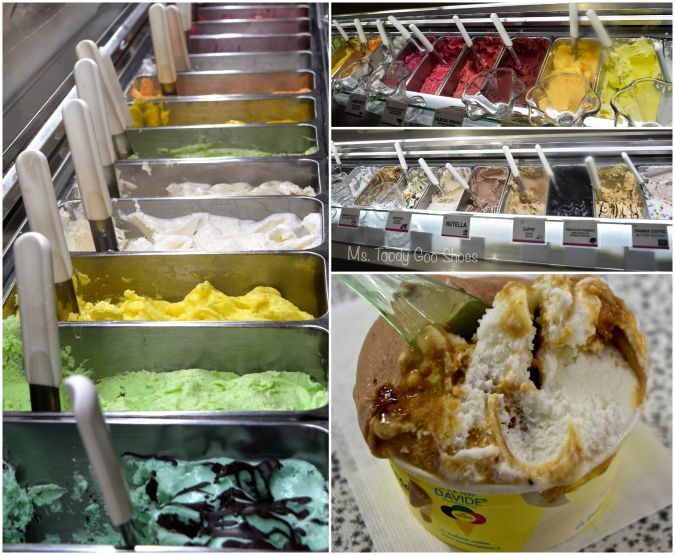 We duck into Davide's gelato; there must be 50 flavors. One is Nutella! I'll have that and the caramel, per favore. Mr. GS is ordering vanilla chip and white chocolate. Gelato is the perfect way to end the day. 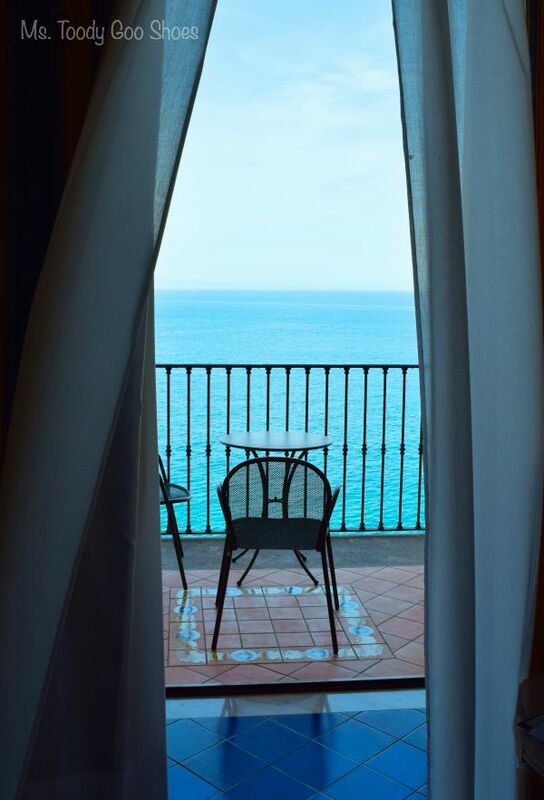 Waking up on a beautiful sunny day and looking out at the Mediterranean Sea -- not too shabby. I hope no one can see me on the terrace taking pictures in my nightgown! I'm ready for my first real Italian breakfast. We are led to a table by the window. The stunning sea view is good for digestion, I think. There's "uova strapazzate" -- scrambled eggs. I remember this from the Italian CD I bought years ago. Also, salami, ham, yogurt, cheeses, pastries. Mr. Goo Shoes is laughing at my overflowing plate. I'll walk it off, I tell him. We want to check out the beach area that we can see from our terrace. Our hotel has an elevator down to sea level. Holy moly! 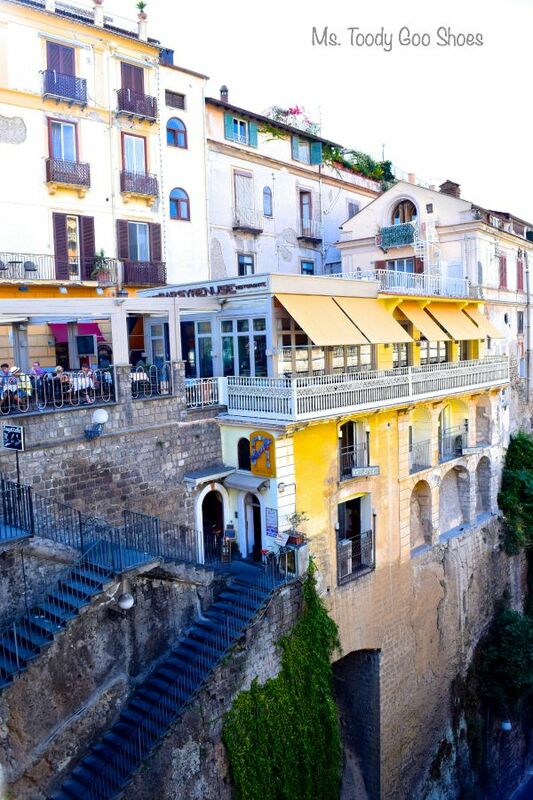 Sorrento looks so different from this perspective. Our room is on the first floor, last arched door on the right. Yipes, now that I see our terrace from this angle, I'm not so sure I want to sit on it anymore. 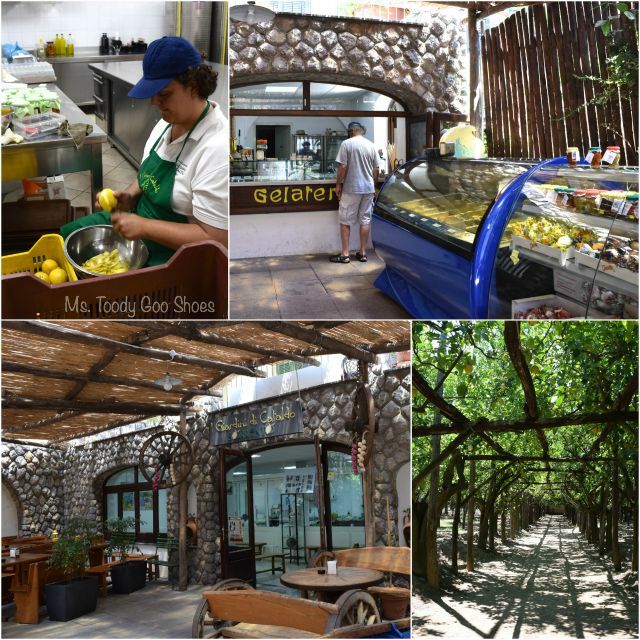 I remember hearing about a lemon grove in the center of town, so I find it on google maps, and we head over. I must not have looked up the right thing, because we end up at a little shop called I Giardini di Cataldo. It's cute, we're hot; we go in. Turns out they make their own Limoncello here. Geez, they really do peel all the lemons by hand. It's morning, but we order gelato anyway. What the heck? It's way better than last night's. They give us directions to the lemon grove. 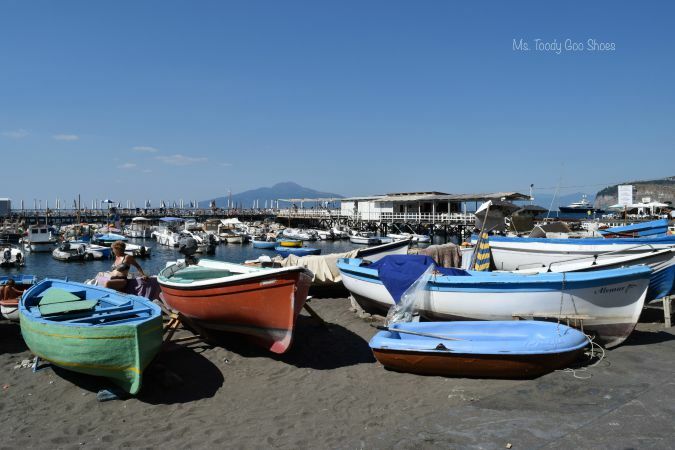 Later, we venture down a steep path to Marina Grande, the main beach in Sorrento, which is also a fishing village. Gonna be fun walking back up! Oh, wow, it is so picturesque, like a postcard. There are lots of places to eat lunch, but we'll be back down here for dinner tonight. 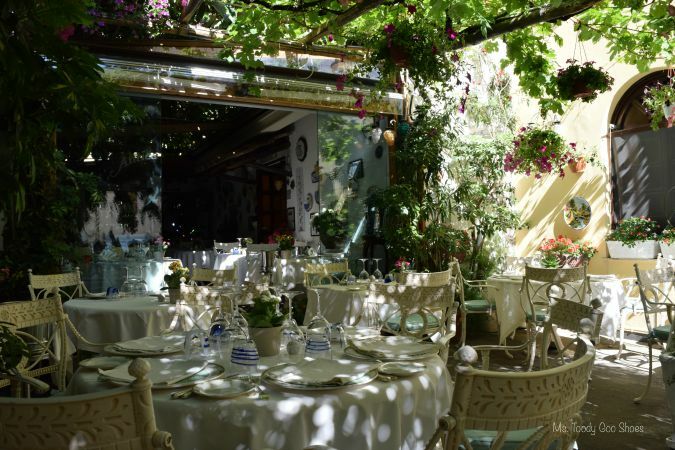 Besides, I've been eyeing this pretty restaurant in town -- L'Antica Trattoria. Time to hike back up. It's magical! I order the fried zucchini blossoms. O.M.G. I think this might be the best thing I have EVER eaten. EVER EVER. (Read about it here). I consider canceling our dinner reservations, and just coming back here. 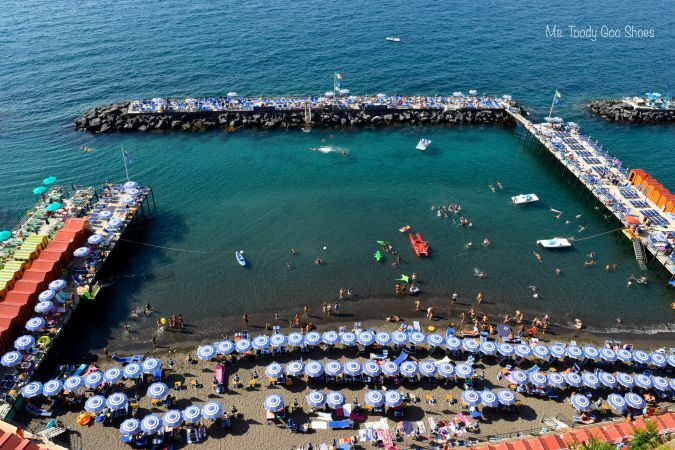 I'm disappointed that we couldn't get into Bagni Delfino for dinner, but the concierge recommends ZIntonio Mare, also on Marina Grande. The setting sun's reflection on the water and buildings is spectacular! I order zucchini blossoms for the second time in six hours. Mistake. Not even close to the ones I had earlier. My spaghetti with lobster is amazing; Mr. Goo Shoes isn't quite as happy with his gnocchi. It's such a nice night, that we walk over to the little park overlooking the water. How perfect that an accordion player is providing free entertainment. 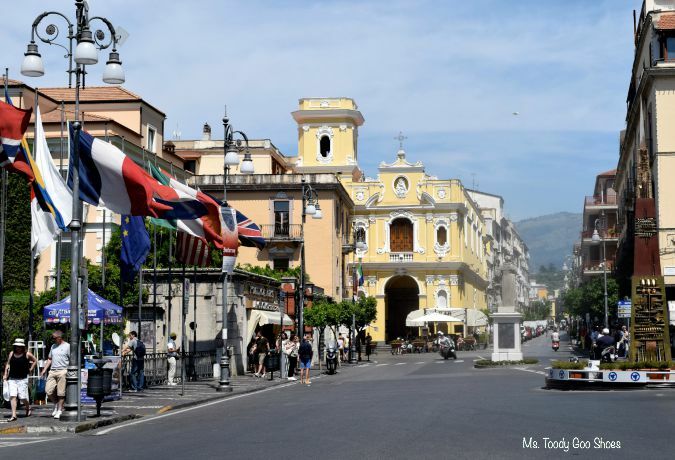 Is everyday in Sorrento this sublime? 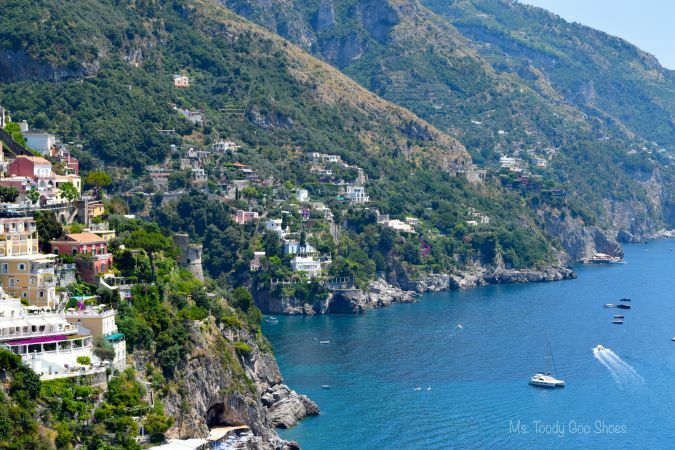 I could definitely stay longer, but in the morning, we are off to Positano...and I've got a feeling that the best is yet to come! Sorry for so many photos - I couldn't help myself! Rick Steve has nothing on you, Amy! You should apply for his job when he retires. 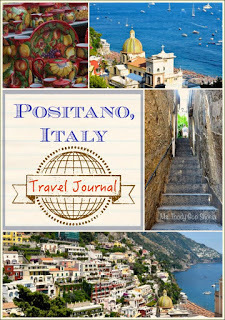 Your photos are travel magazine worthy! I can't believe how high up your hotel room was! Actually I want to print out this whole post and keep for bedtime reading again and again. That is simply beautiful. I would have to add it to my ever growing bucket list. Oh my gosh Amy! I so loved this post!! I agree with Dewena. You rocked it, and I couldn't read it fast enough! It looks like heaven. Did you NOT want to come home? Did you want to just throw caution to the wind and live there forever?? I would! Zucchini blossoms are one of my most favorite foods, but like you learned, they have to be done right. And when they are...holy quap! I am loving all of these beautiful pictures of your trip! I was practically licking my screen when I saw that gelato! Oh so yummy! Wow - so stunning! What a great trip. What a beautiful time. I thoroughly enjoyed coming along with you on the tour. 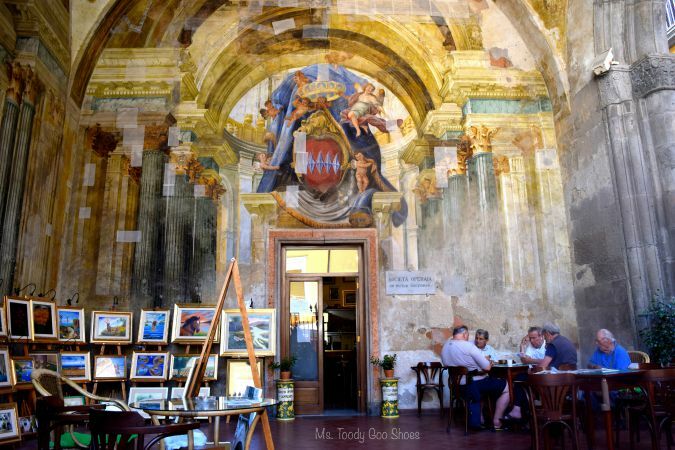 I loved this area of Italy. Like you I could have stayed the rest of my life there.Our hotel was on the cliff too. It was just a walk down the side to get to ocean. The part I found strange was the color of sand. black and course.Nice quiet place compared to Rome or the other big cities. Capri was excellent too. 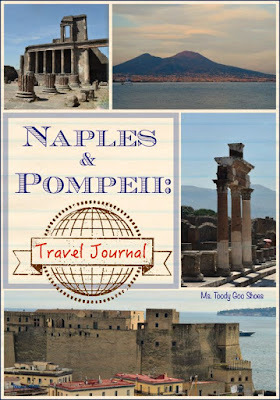 I'm sorry you did stay longer at Pompei it was very exciting tow hours wasn't enough you really needed the guide for the 2 hours then explore the rest of day. So much history. 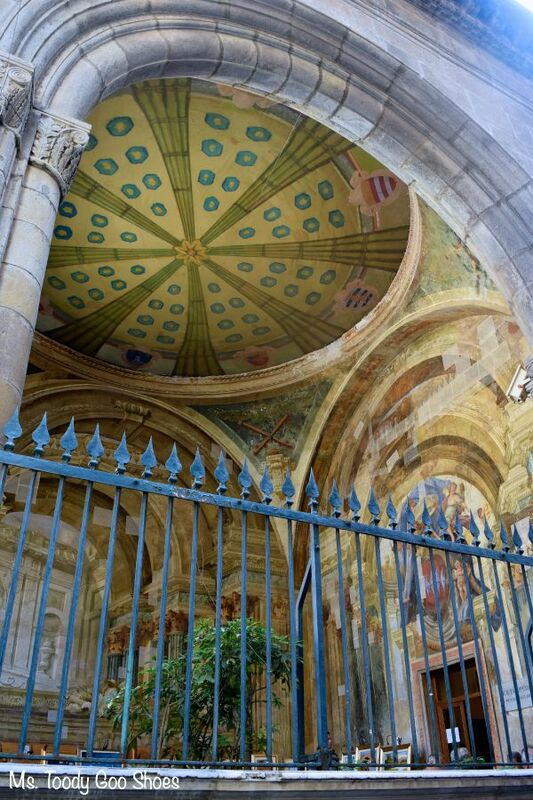 just think the Romans built that over 2000 years a ago and only 30 % has been uncovered.There are water lines , sewer lines and all they they made that worked. They even had water fountains at the ends of streets they used. No they all had lead poisoning I'm sure but you can still see the pipes.You missed so much by leaving trust me. Well, I am now armed and ready to return to the Amalfi coast. Great details! Oh my! It is just how I remember it! I may have stayed in the same hotel as you did because it looks so familiar to me! I have memories of the open patio overlooking the sea and then looking down to the sunbathing area. I also remember getting down there and there was a woman sunbathing without a top....normal for them! We had a balcony in our room too. 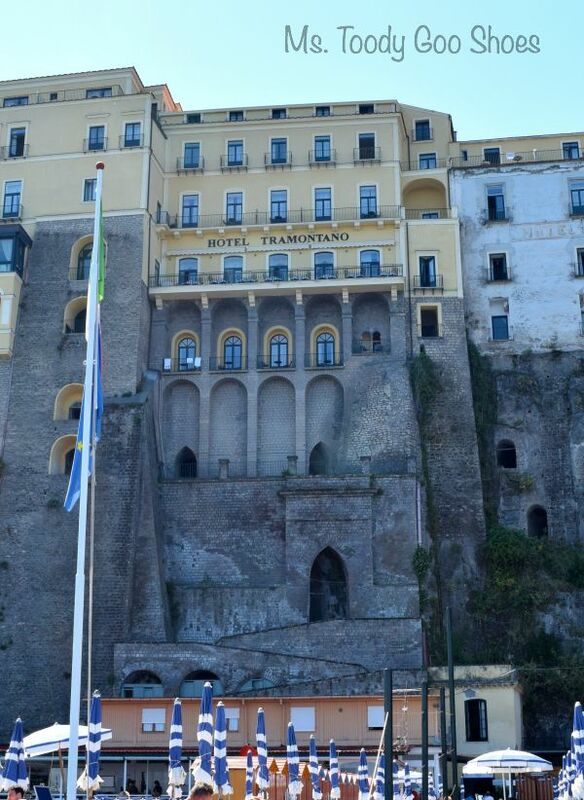 We went on one of those tours and our room in Rome was so bad that they upgraded us in Sorrento! I don't remember the names of restaurants because the tour chose every where we ate. We will do all that on our own the next time. Your pictures are great! I loved seeing all of them! Fabulous Amy - just fabulous. Can't wait to hear about your next stop !! Good Morning, I did find a different way to Pin, but I did write it out on a lovely card any hoot! 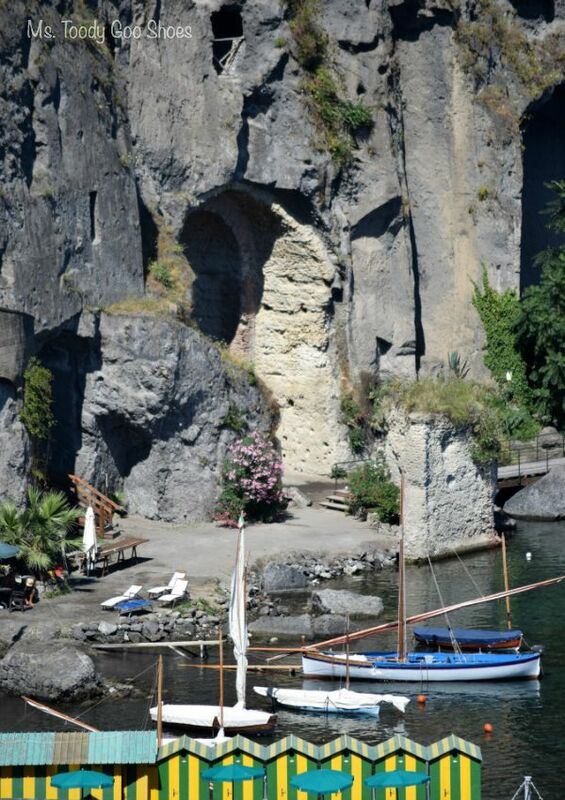 I just also enjoyed my tour her in Italy... Amazing places in this world, but so far I only have my own backyard! Thanks for that virtual vacation... I really needed it tonight as today was not the best day, now if you could pass the limoncello, I'm sure all will be better! Your trip looked amazing. Did you plan this on your own or did you go through a travel agent? Hello Amy! I love the pictures. 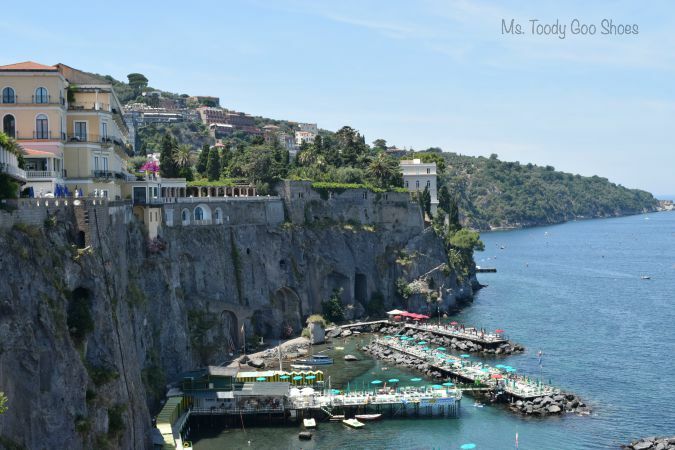 Sorrento is amazing! Do not worry about the number of photos. This is how I like posts! I want to see as much as possible of a place thru your experience. This is the Sorrento I remember. Would love to go back. What a wonderful view from that hotel! 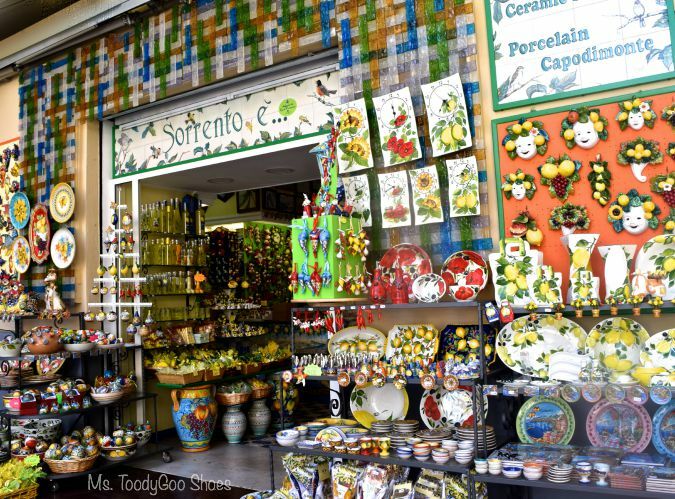 When we were in Sorrento, my daughter wanted to go back to some store and described it as "next to the place that sold lemon stuff." That didn't help at all. I really wish I had bought one of those huge Sorrento lemons just to taste. Anyways, I still haven't been able to grab my vacation hold mail to see what's in the package. I'm sure it's wonderful. Whoa! That looks like some serious shopping fun! Thanks for sharing at Home Sweet Home! What a fabulous trip! My summer vacay was to Wisconsin. :( I'm reading this backward, so heading to Part 1 now! 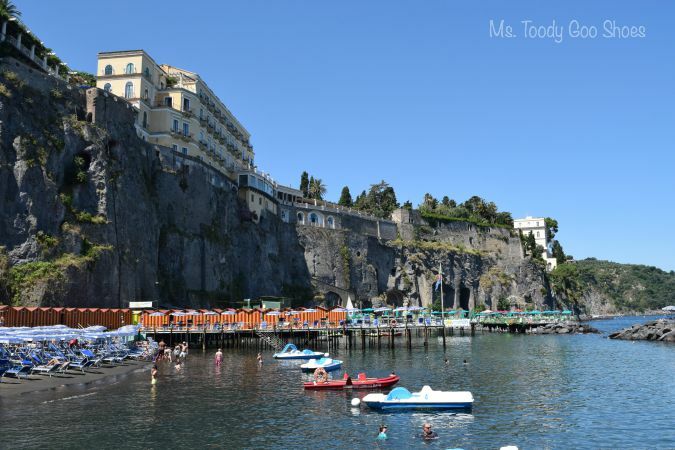 Sorrento is the only place we visited in Italy that still stands out in my memory after 20 years! It will be our destination when we finally get back there. Thanks for filling in the parts I just don't remember after all that time! 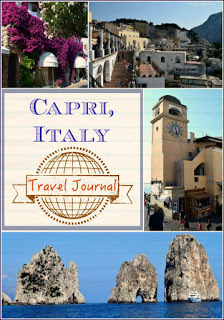 I do my overseas traveling in the winter, so it was fun to see Sorrento in a different season! These photos are amazing and brought back many memories of my trip there 25 years ago. 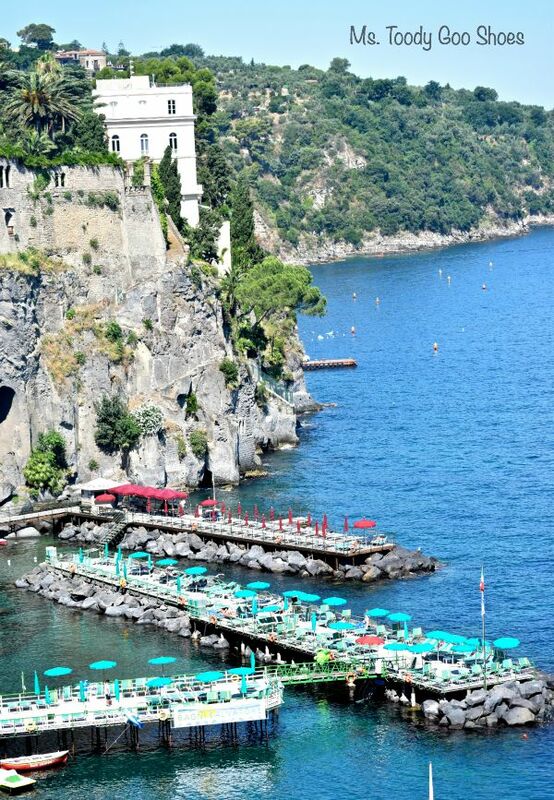 Italy is one place that I absolutely must get back to one of these days. Truly magical! Thanks for sharing at Take me Away! I enjoyed your trip to Sorremto! It sounds perfect. 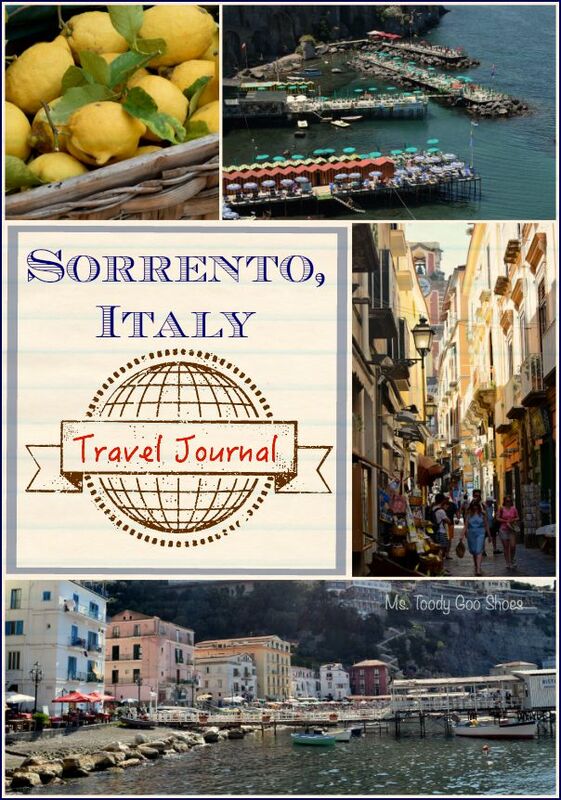 I have been to Italy 3 times, but never to Sorremto! I think I need to go! Best of the Weekend # 114 and More News! 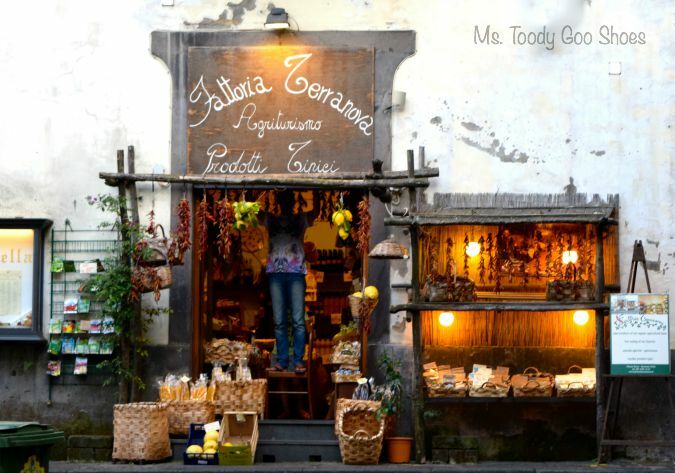 Where In The World Is Ms. Toody - A Giveaway!